As many of you know, the Catalyst conference in Atlanta, Georgia is my favorite conference. 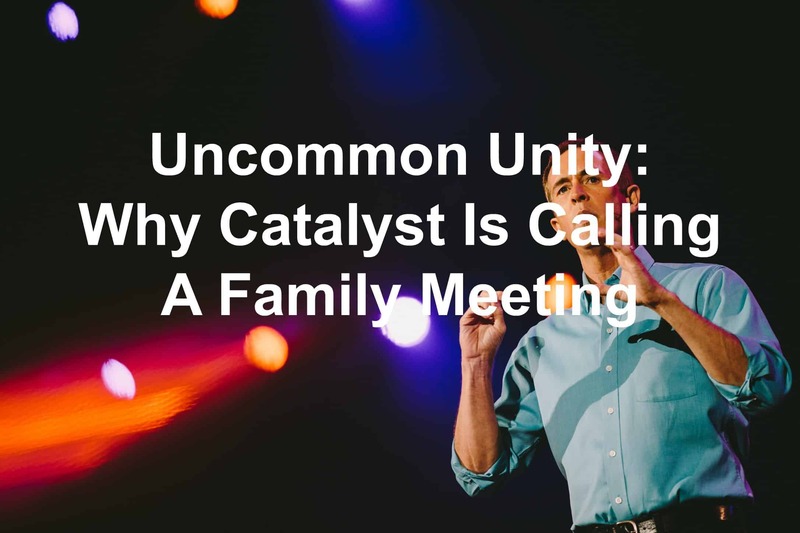 Today, Friday, and Monday, I’m thankful to welcome members of the Catalyst staff the opportunity to share a little about the Catalyst conference and what’s going on this year. First up is Tyler Reagin. You may remember him from the 2nd episode of the Answers From Leadership podcast. It’s common in our culture to sort, divide, and exclude. These days, we often look out for our own best interests, but we believe Jesus is building something uncommon. He is building something that invites, transforms and sends. This year’s Catalyst Atlanta event is about coming together, not as the same, but as uniquely gifted pieces forming an effective whole. And leadership is at the core of building that unity within the Church. So, this October, we’re calling a family meeting. Before we dive deeper, you may be wondering if Catalyst is really for you. Let me answer that. Catalyst is built for any leader who desires to sharpen his or her skills in leading themselves, others, and teams and organizations that bring deep-rooted, gospel-centered change in this world. And that’s one reason we’re diving into the topics we are this year. It’s time to bring us all together. Our theme of Uncommon Fellowship isn’t your typical unity discussion. We believe that through the commission of Jesus and by the power of the Holy Spirit, the local Church is set up to release hope to a lost and broken world. As leaders, we must be intentional about developing our leadership skills and the leadership skills of our team in order lean in and lead well for such a time as this. This is a leadership event like no other. Come ready to be both refreshed and equipped within a highly experiential, highly inspirational environment. In the New Testament, God paints a beautiful picture of the Church as a family, His bride, where individuals accept one another and invest in each other despite differences. This body of believers joined together in fellowship to serve their community and fulfill the mission of the Church, growing it along the way. We cannot fulfill our mission as the Church if we are a fractured body. If you want to see the Church join together in unity, we would love for you to join us October 5-7 to come experience Uncommon Fellowship.